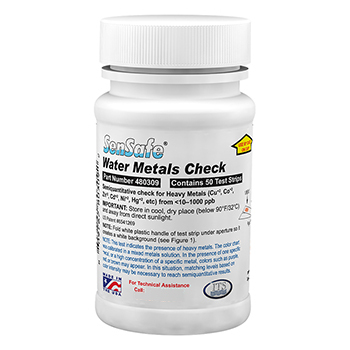 Water Metals Check test kit is a semi-quantitative contamination check for Heavy metals in water. Test strip detects metals in water in under 1 minute. Contains 50 test strips. Checks for the presence of Cadmium, Colbalt, Copper, Iron, Lead, Mercury, Nickel, Zinc and other +2 valence metals: Cu+2, Co+2, Zn+2, Cd+2, Ni+2, etc...This test is a very attractive alternative to wet chemical iodine tests. No reader is required, no other chemicals used, just dip a test strip in water and read color-coded results. If more than one metal is detected, values are combined. Safe and easy to use, an MSDS is not required. Indicator is noncarcenogenic, which makes it easy to use at home or in the field. Detection levels are: <10, 20, 50, 100, 200, 400, 1000 ppb µg/L. 3. Wait 2 minutes, and match with closest color on the color chart (included). Test detects total amounts of +2 valence heavy metals that may be present in tap, well, stream water or lab samples. If you need to detect larger amounts, dilute the water 1:1 with distilled water (or water where metals are non-detectable), and try our test again. Continue diluting sample 1:1 until you get a readable test, then multiply result by the number of dilutions.